At our Monterey bed and breakfast our goal is to make every portion of our guests’ visit enjoyable, but breakfast time seems to be the most anticipated part of the day. Our dining room is elegant and cozy with the fire burning and guests chatting about their adventures from yesterday. Every morning we serve a beautiful gourmet breakfast, and invariably the conversation turns to the food that is being served. The menu changes daily, though no matter what the menu, it’s always scrumptious. Not a week goes by that someone won’t ask for a recipe or if we have a cookbook of our recipes available. Since our recipes are not compiled into one book (on the to-do list! ), we thought this might be a good venue to share a few favorites with everyone! 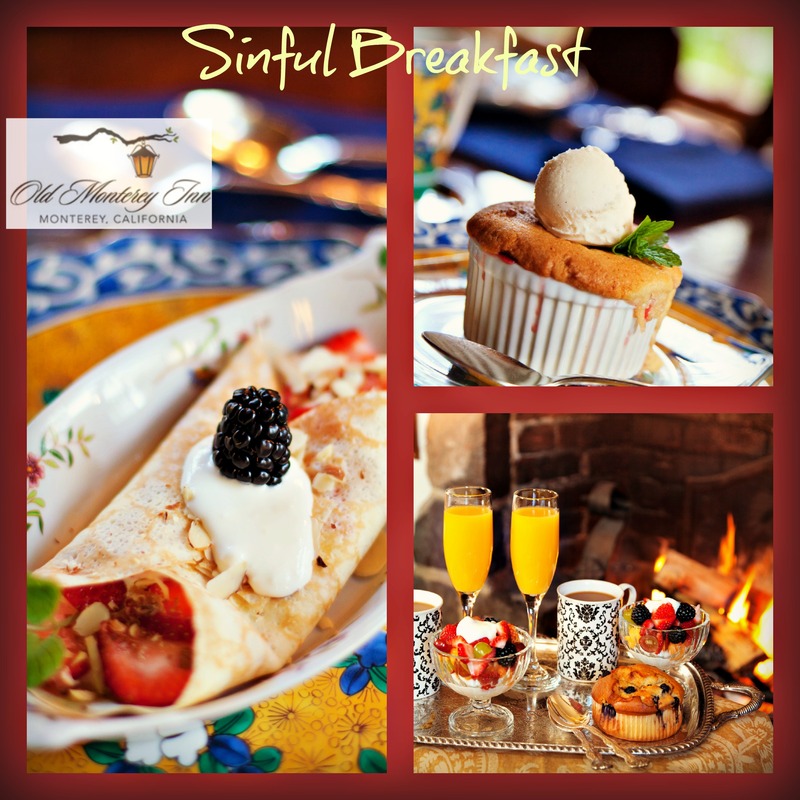 Enjoy sinful breakfast in Monterey! In a blender, whip the cottage cheese and the cream cheese until smooth. Blend in sour cream, powdered sugar, and granulated sugar. Blend in heavy whipping cream. For best results, refrigerate for 8 hours so that the crème can thicken. The crème is sweet and rich, and would be just fabulous as peaches and crème, strawberries and crème, spoonful of crème… you get the idea! We hope you enjoy the crème recipe—stay tuned for other recipes and Monterey upcoming events. Mix thoroughly. Add tears, joy, sorrow, sympathy. Flavor with love and kindly service; fold in four cups prayer and faith after pouring all this into daily life; bake well with heat of human kindness. Serve with a smile; it will satisfy the hunger of starved souls. Preheat oven to very slow (250 degrees). Whisk egg white and water in medium-size bowl until foamy. Stir in nuts; mix well. Drain if necessary for 3 minutes. Combine sugar, salt, cinnamon, ginger, allspice and coriander with nuts in medium-size paper or plastic bag and shake well to coat. Spread nuts out on large cookie sheet making sure they do not touch. Use a little Pam on cookie sheet if needed. Bake in preheated oven for 15 minutes. Stir nuts and spread out again. Lower oven temperature to 225 degrees; bake, stirring occasionally, 1 hour and 15 minutes or until nuts are well dried and crispy. Turn off oven; let nuts cool with oven door open. Cool nuts completely at room temperature. Store in airtight container. Nuts can be refrigerated for several weeks or frozen for 6 months. Makes about 4 cups. Blend eggs, sugar, salt and oil. Mix baking soda with persimmon pulp; add to sugar mixture and blend. Fold in flour and cinnamon, then nuts and raisins. Pour into 1 regular loaf pan or 2 small load pans, oiled. Bake in 350 degree oven for about 60 minutes for large loaf, less for small loaves. Join us in our Monterey bed and breakfast and try some incredible breakfast and hor ‘dourves today!